I have written before about Col. William Smith Clark, a historical figure whom I very much respect. In an earlier post I described one of his more interesting exploits as colonel of the 21st Massachusetts Volunteer Infantry during the Civil War. I thought I should write a bit about the considerable work to which he devoted most of his career, namely the founding of two universities on different sides of the globe. One is now the University of Massachusetts Amherst, the other the University of Hokkaido. The great irony of Col. Clark’s legacy is that he is literally legendary in Japan while in Massachusetts (outside of Amherst) he is virtually forgotten. I will do nothing to show or seem to show that I am disheartened or dissatisfied with the government, even though those in charge of affairs act neither wisely nor well…The whole Army of the Potomac is under orders to march tomorrow. God grant it may not be to new disasters and fruitless butchery. Suffice it to say, after gallant service and much strife, Clark was done with war. He resigned his commission in June 1863. And the fortuitous timing was not, I think, completely coincidental. A great undertaking was underway in Massachusetts at that time. The legislature had just voted to establish the Massachusetts Agricultural College, something for which Clark (and many others) had long advocated before the war. Doubtless, when Clark heard of this, he knew it was time to return home. By 1867, the Massachusetts Agricultural College (MAC) had gone through two presidents and had yet to complete a single building or admit a single student. Clark had been hired as a professor of botany, but he could only sit on the sidelines while administrators and politicians bickered over the site of the college and its curriculum. 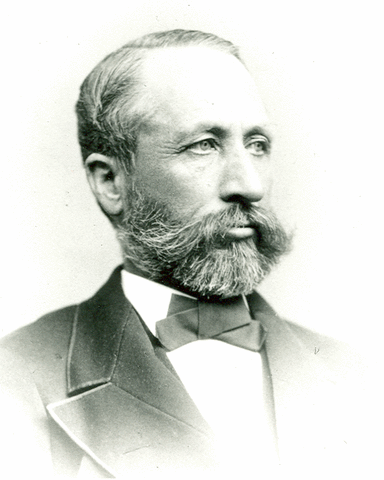 It was Clark who convinced the Board of Trustees to locate the college in Amherst. And in 1867, they turned to him for leadership and appointed him president. Just months after his appointment, Clark had completed the college building plan and admitted the first class of students. The MAC was his great pride and joy. Despite the fact that Clark’s revolutionary college was coming under fire and in jeopardy, individuals nearly 7,000 miles away in Japan heard of Clark’s work and were seriously impressed. Japan at that time was going through a metamorphosis. The Meiji Restoration in 1867 saw the overthrow of the feudal Samurai government and the installation of a new emperor, young Meiji. His new government saw that the only way to survive in the face of threats from the West was immediate modernization. To accomplish this, the Japanese government brought in the Oyatoi gaikokujin, or “hired foreigners”…western scholars, scientists and soldiers who would help the nation transform itself into a modern, capitalist power. A staggering task…yet brilliantly successful. Clark was one of these experts. 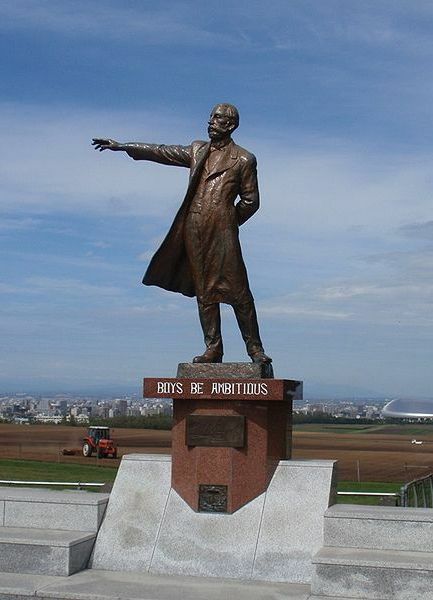 In 1876, Clark was hired by the Japanese government to establish the Sapporo Agricultural College (SAC) on the island of Hokkaido, the northern frontier of Japan at the time. The governor of Hokkaido, Kuroda Kiyotaka, recognized that advanced agriculture would be crucial to the sustainability of a modern power. He therefore gave Clark wide latitude in the creation of the college and the implementation of broad government programs that would transform the island of Hokkaido. This wonderful emancipation from the tyranny of caste and custom, which in ages past has enveloped like a dark cloud the nations of the East, should awaken a lofty ambition in the breast of every student to whom an education is offered. Let every one of you young gentlemen strive to prepare himself for the highest positions of labor and trust and consequent honor in your native land, which greatly needs your most faithful and efficient service. The phrase is now legendary in Japan. Today, the SAC is known as the University of Hokkaido. Clark’s visage overlooks Hokkaido from several statues, including a particularly striking one atop Hitsujigaoka Observation Hill outside Sapporo. Elementary schoolbooks across the country contain his picture and a brief story of his life. Back in Massachusetts, he is virtually forgotten. The MAC eventually became the University of Massachusetts. But the institution was all too eager to forget its “cow college” origins. Only relatively recently at UMass has there been an effort to remember Clark. In 1991, a handsome rock garden, the William Smith Clark Memorial, was built on the former site of Clark’s house at UMass. Plaques containing information on different aspects of Clark’s life are scattered across the site, and visitors must follow brick trails to seek them out. It is beautifully done. But it is far on the outskirts of campus and entirely modest. Driving by, it seems to simply be a bit of unusual landscaping. Oddly fitting in a way. A figure larger than life in Japan is interpreted as simply a part of the landscape in Massachusetts. Such is the legacy of William Smith Clark.